Disney Hipster Blog: So THATS Little Egypt Doing The Hoochie Coochie! So THATS Little Egypt Doing The Hoochie Coochie! One of my absolute favorite attractions at any Disney theme park is Walt Disney's Carousel of Progress. Though it has been updated a few times since its debut at the 1964 New York worlds fair, the attraction has a similar corny/awesome feel. One of the most endearing aspects of the Carousel is its antiquated pop culture references. You see, Carousel of Progress takes place over the course of the entire 20th century...therefore, the writers take liberties with the jokes included. These references would have been commonplace during the period in which the scene takes place...but rarely land today. Something that always flew right over my head is found in the first scene of the show. In the video below, James (the son) is caught taking a peek at "Little Egypt doing the hoochie coochie." 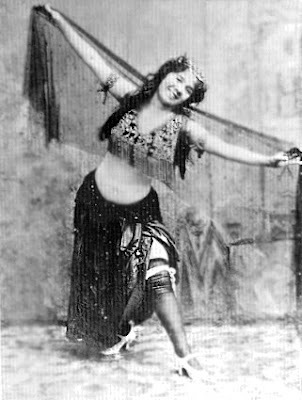 Turns out that Little Egypt was in fact three rival dancers all working under the same name...with a multitude of impersonators knocking off their act. These dancers all gained notoriety through their provocative and sexual boundary pushing. It seems that one of the knock off "Little Egypts" was performing at the 1904 World's Fair in St. Louis, which is the one referred to in Carousel of Progress. A rare look at the girls in action. It clearly was taboo at the time.